The Promotion Committee is provided free bookmarks, and pads to be used as "give-a-way's" at demos or as a recruiting tool. The items highlight the three most important benefits of dancing - fitness, friendship and health - with the appeal to "Learn to Square Dance". · the provincial 1-800 Info line number. 2) printing Avery-style "peel and stick" labels on a home computer and printer. Stamp or attach the labels in the boxes on the bookmark and business card, and on the back of the note pad. These items are FREE only to Clubs affiliated with the Fraser Valley Square & Round Dance Association. Delivery may take 4 to 6 weeks depending on stock available. Orders must be placed through a single person at the Club, preferably the person responsible for the club's new dancer program. Quantities may be limited to 100 per item. Any or all items may be requested. Availability dependent on Promotion Committee monies allocated to this offer. Actual size is 4 1/4"" x 2 5/8""
Afix club contact information to BACK of pad. 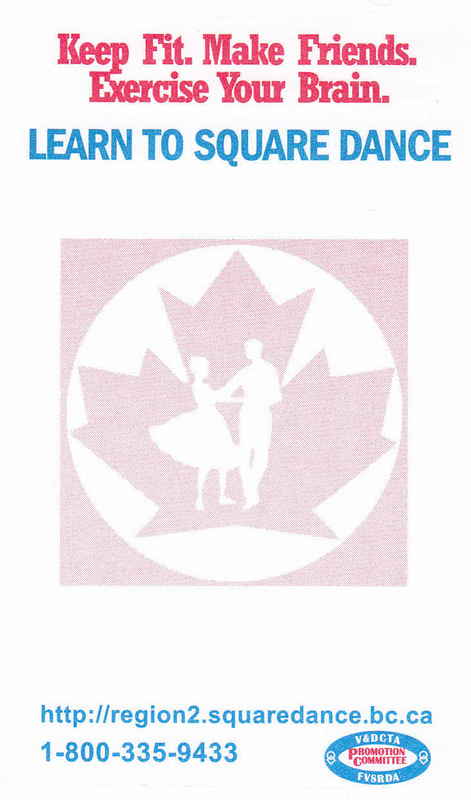 Actual size is 81/2" x 2"
Above is an example of a generic new dancer recruitment brochure that Clubs may download and modify as they require. The brochure is designed for an 11" by 8 1/2 " single sided format in Microsoft Word (.doc) format compatible with versions 2010 / 2007 / XP / 2003. The brochure is designed for black & white printing, however, all the text can be changed into colour. The sample picture and the text can be replaced or modified as required with a club specific photo and text. Download Word brochure here. To download, right click on the link above and select "Save Target as" from the menu. When the "Save as" window appears find the folder you normally save items to and click on the "Save" button to copy it to your computer.